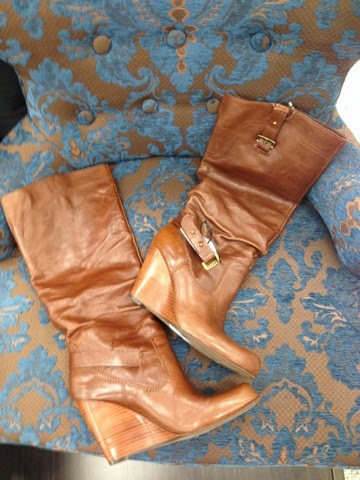 I don’t know about you, but when I think about fall, I think about adding to my boot collection. Every September I’m pining over the latest styles and enthralling myself in the shoe section of my fave department stores. I love the classics, and I also look for boots with a twist. Before shopping, I generally purge my shoe collection by donating them or handing them down to my nieces. One of my nieces is 8 yrs old, and she’s always hustling me for some of my heels. I was surprised to find out that she can actually walk in them. Of course, her mother isn’t going for an 8yr old in 3 inch heels so she will have to wait a few more falls before she gets my hand me downs lol. Last year I’ll have to admit that it was all about the bootie, when it came to boots that is, but this year I was searching for an awesome riding boot! I decided to start my boot shopping at Ross Dress For Less. There were so many great styles at Ross that it was really hard for me to choose. Originally I was going for a black pair, but I realized that I was literally a black shoe connoissuer. While searching through the aisles of awesomeness, my husband noticed a pair of brown boots. He brought them to me, and I tried them on and immediately fell in love. I knew these were the boots for me. I’m so happy that we went when we did because they were the only pair. These boots are definitely my fall favorite! I want to know about your fall favorite and also tell you about a chance for you to win $150.00 to shop for your fall faves at Ross Dress for Less. Visit the Ross Dress For Less Facebook page to vote for your favorite fall blogger look! · Each week, they will be sharing a different look and you’ll be able to vote up to once per day for your chance to win. · Each week they will randomly select two $150 gift card winners who will have a chance to shop for fall essentials at Ross! This post was sponsored by Ross Dress for Less.